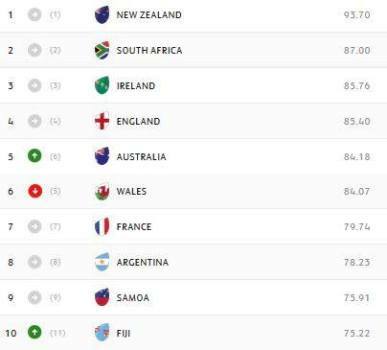 The Vodafone Flying Fijians rugby team has moved into the top 10 in the latest World Rugby rankings. With the win against Tonga over the weekend in the Pacific Nations Cup, and previous 10th place holders Scotland not playing, Fiji pushed itself above the European nation. The Fijians have another chance of closing the gap on Samoa who are on ninth position, when the Pacific rivals meet this Saturday. New Zealand All Blacks maintain their top position while South Africa and Ireland complete the top three. Meanwhile Fiji plays Samoa at 12 pm this Saturday in USA.